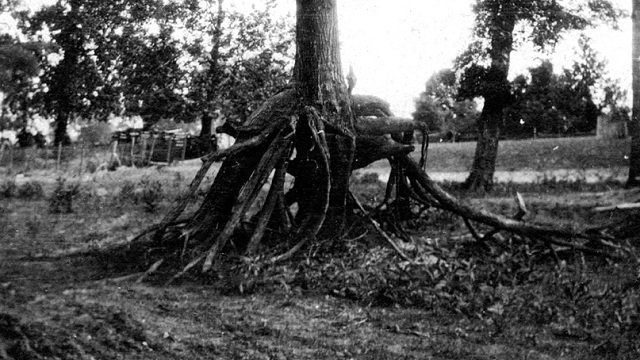 A tree buried by 5 feet of sediment in the 1811-12 earthquakes grew new roots before Mississippi River floods exposed it again a century later. USGS photo from Bulletin 494, 1912. A new study looks at the Midwest site of one of America's greatest earthquakes and argues that its seismic activity is not fading away, but steady on a course toward large future quakes. In the winter of 1811-12, a cluster of four fearsome earthquakes in the central Mississippi River valley literally rocked the nation. Shaking was felt as far away as the Atlantic coast. A large area was thoroughly disrupted around the common borders of Missouri, Arkansas, Tennessee, Kentucky and Illinois. Riverbanks collapsed, farm fields erupted in mud and sand, large areas of land turned to jelly, and part of northwestern Tennessee sank and filled with water to form Reelfoot Lake. Today scientists know these earthquakes as the New Madrid sequence, named after the small Missouri town ("New MAD-rid") near their epicenter. The land was largely wilderness at the time. Not so today. A repeat of the New Madrid quakes would be a calamity on a par with Hurricane Katrina or the 1906 San Francisco earthquake. The larger cities affected would include Little Rock, Memphis, St. Louis and Evansville. So the study in today's issue of Science is part of a genteel scientific argument with expensive consequences. How much should these places spend on strengthening buildings? How should their building codes and long-term planning reflect seismic risks? The answer depends partly on where the region sits in the earthquake cycle. Some researchers have concluded that the 1811 quakes are long finished, including their aftershocks, and that the small quakes we detect today are part of the steady buildup of stress between large ones. Others have argued that in places like this, which are far from the active edges of any tectonic plate, aftershocks last many times longer than they do in, say, California. Is the next New Madrid quake "busy being born," as Bob Dylan might have put it, or is the 1811 quake still "busy dying"? The "dying" model suggests that earthquakes will grow fewer and smaller until seismicity reaches some background level as time goes by. The other model suggests that we're already at background level, and seismicity will not fade away. The Science paper, by government seismologists Morgan Page and Susan Hough, compares the expected pattern of seismic events to the earthquake record, such as it is. The question they asked is whether the record fits an aftershock pattern. They conclude that it definitely does not. The record is not ideal for science. The New Madrid quakes occurred with few witnesses, none of them trained scientists. Seismometers were not available for another hundred years. But we do have some firm information gathered from historical sources like newspapers and letters. Our most certain information, Page and Hough argue, is that the cycle began with a cluster of four big events, that only two earthquakes after 1812 reached magnitude 6, and that today the region gets about three events per decade of magnitude 4 or greater. Using these three constraints, they ran a standard model, the Epidemic Type Aftershock Sequence, more than 10,000 times with a wide range of inputs. None of the model runs could fit all three constraints. The key fact seems to be the absence of magnitude 6 quakes: runs that met the other two constraints called for an average of 135 of these over the 200 years since 1812! That didn't happen. "If current seismicity in the New Madrid region is not composed predominantly of aftershocks, there must be continuing strain accrual," Page and Hough conclude. In support, they cite newly published evidence from GPS measurements that strain is building up deep in the crust in the New Madrid region and suggest that it "will continue to be a source of hazard." The U.S. Geological Survey has lots more information about the earthquake hazard there and in the adjoining Wabash Valley seismic zone, which threatens Indianapolis and its neighbors. Where is all this energy coming from? Again, there are two arguments. One is that the continent is responding to the loss of the great North American ice cap some 12,000 years ago. The other is that stresses from deeper in the mantle, where the subducted Farallon plate is slowly sinking while the North America plate sidles over it, are responsible. I think that both candidates are worthy.